I am aware that the early 20th century Greek army began to replace its Steyr-made M 1874 Gras bayonets with at first the Steyr-made M 1903 and then the Steyr-made M 1914 bayonet. 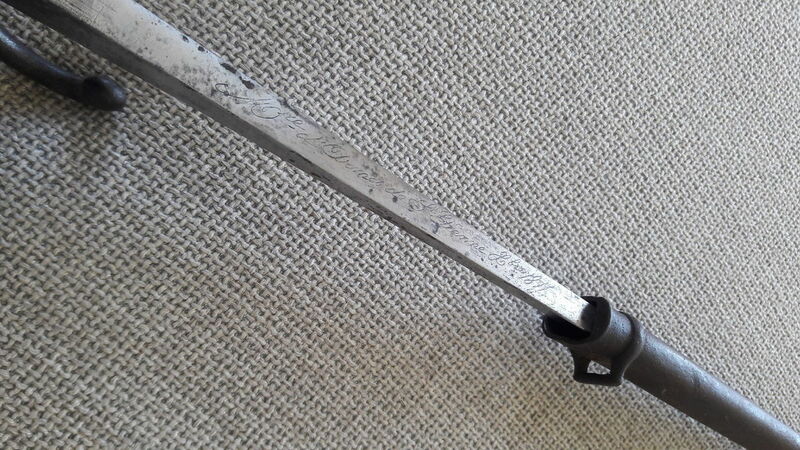 I also know that thanks to the Greek decision (at first) to stay neutral the supply of Steyr M 1914's dried up sharpish. What I don't understand is this. 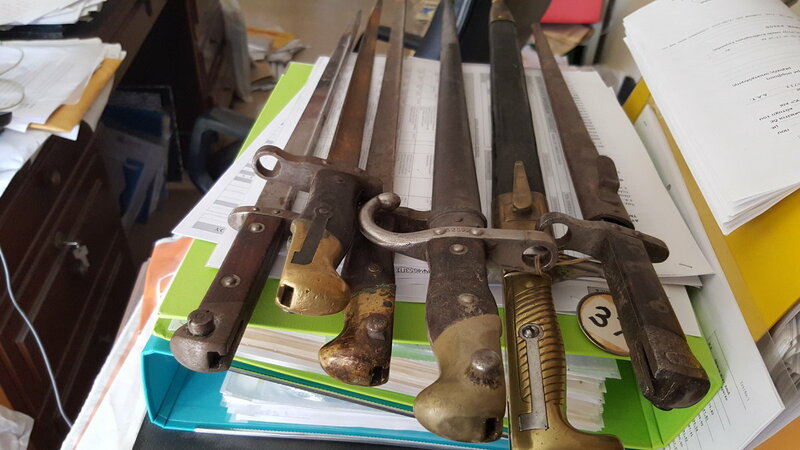 Apart from a single M 1903, the only Greek bayonets I have ever seen for sale in Turkey in the last 10 months or so have all been 1874 Gras-types (I have recorded over 6 to date [and bought two], the latest dated 1885). I think it is reasonable to assume that the Greek bayonets on the market here are likely to be left-overs/captures from the Greek invasion and the (Turkish) War of Independence 1921-1922. So, a very small sample, I know, of no real statistical value, BUT it seems to me from this 'evidence' that during WWI and after, the Greek army was still dominated by the use of the Gras rifle. Anyone out there know if this is true or not? Trajan, how are they marked? I don't know the answer to your question but I have never seen bayonets used in Greek service (or any kit come to that). ... Trajan, how are they marked? The ones made by Steyr specifically for the Greeks and their Gras have 'WAFFENFABRIK STEYR' and the date in script on the spine. 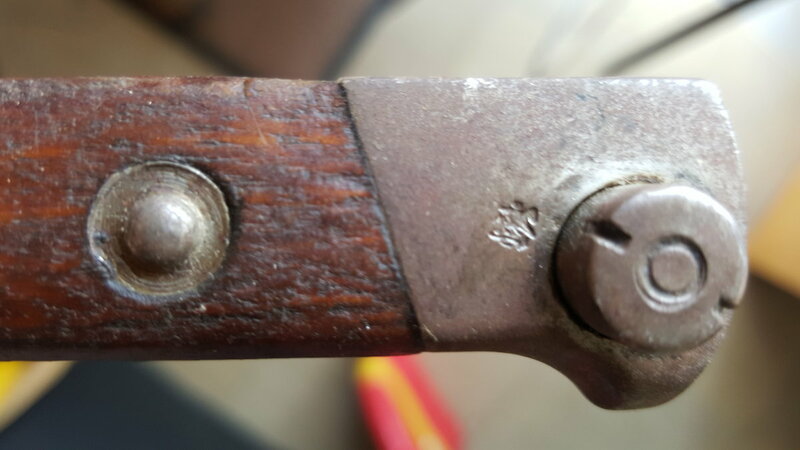 I have also seen two with the letters 'AD' between the rivets on the crossguard left side, and the ones I have examined have serial numbers between the crossguard rivets on the right side. They do not have any of the usual French markings on the blade, but I read somewhere that France diverted some of their own Gras bayonets to Greece after the Lebel was introduced, and these apparently have the regular French markings (including factory name on the spine) but the serial numbers are between the crossguard rivets on the left side. 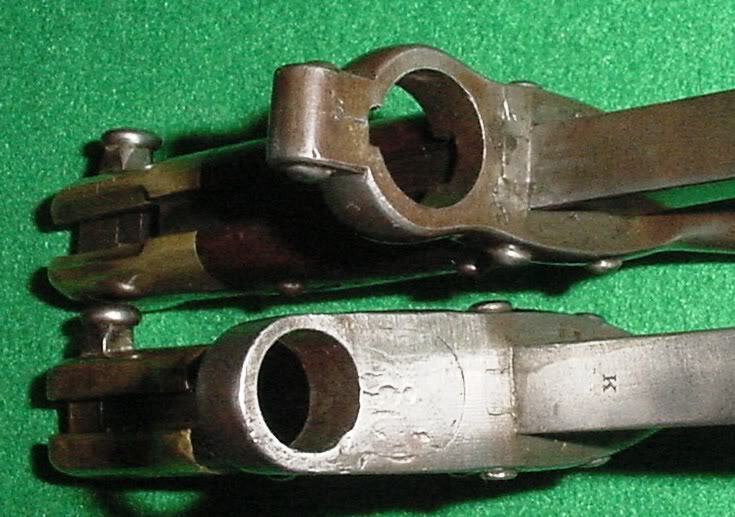 The 1903 and 1914 Mannlicher-Schoenauer ones have the St.George and the Dragon symbol on the pommel. 1886 was the last recorded order from Steyr with 1000 rifles ordered (I'd guess bayonets too), which tallies with the latest date you have found. Thanks Gaz - that's a lot of them Gras' hanging around after WWI then. But still rather odd at first sight that M 1903's are so rare. But, there again, thinking about it (morning cuppa time ), I guess that any captured examples of these could easily have been 'turked' while any captured Gras bayonets were simply disposed off as to much hassle to modify!!!??? After all, the M 1903 is basically a standard Mannlicher 1895 blade with a higher muzzle ring, and a bit of fiddling would get the crosss-guard off and a new 'Mauser'-type one added. 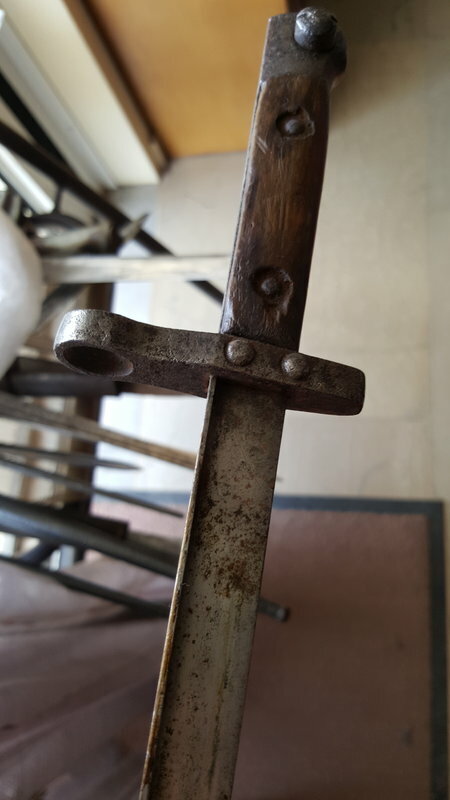 Having done that, scrub the St.George and Dragon off the pommel, and hey presto, you have to all intents and purposes a 'Turked' bayonet with an OEWG marked M95 blade. Mind you, I or someone will have to check if the mortice slots need changing also. Two points follow. Did the Turks ever use Mannlicher-type rifles/bayonets? 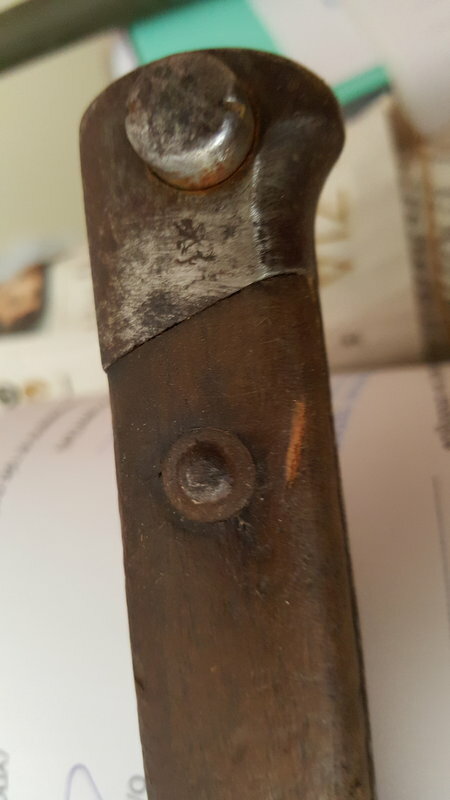 Don't know about the first but I do have a plain (i.e., unmarked) bayonetless Mannlicher 1895 scabbard with a Turkish-marked frog that came from over here. 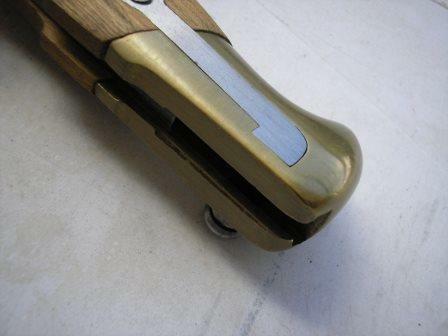 How to identify a modified M 1903 blade? Forgot to add in replying to auchonvillerssomme: the example of an M 1903 I have has the standard OEWG mark on the right ricasso and the single Roman alphabet letter 'G' on the left ricasso. 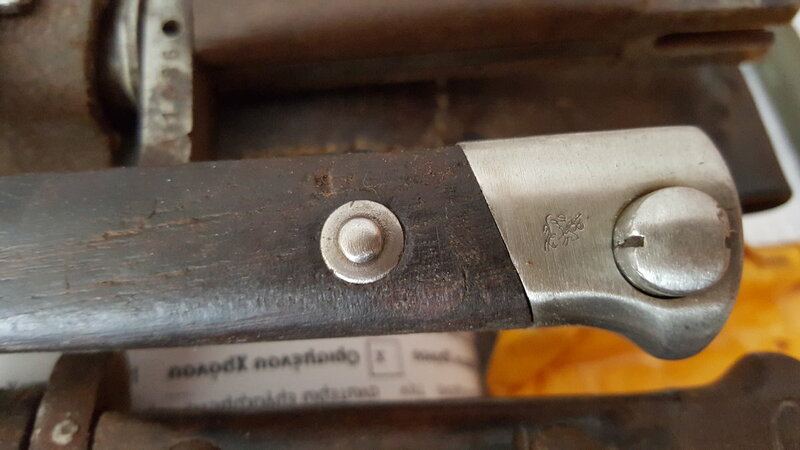 I have interpreted this 'G' as a control mark standing for 'Graechische' to allow the Steyr inspectors to identify a blade intended for the Greek M 1903, but I have no evidence for this. But there again, I have never seen or heard off any standard M 1895's with a single letter of any kind stamped on the ricasso, so it is a possibility. Trajan, I find it is important to first get an understanding of the various rifles that a certain country used, before trying to get your head around all of their bayonets. In many cases there were a variety of types of bayonets used for each single model rifle, and then even more versions as the rifles were continued to be reworked. I haven't looked that far into the Greek bayonets as such, but do know they liked to modify and reuse where possible, which was all too common during that period. HERE is a useful link which gives some detail into the M-S rifle in Greek use. And don't confuse the M1903 T-back bayonet with your much shorter prize possession.! S>S: forgot to say 'Ta' for the link re: MS rifles. And don't worry, the M 1903 is being seriously looked after! Trajan, thank you. I found the notes in Les Baionnettes, Reglementaires Francaises de 1840 a 1918, the above article was taken from it. OK, kids and wife out visiting - so a chance to get back! Thanks to a member of the pointy-things sub-group (and yes, I DO mean you canny lad, and thanks again!) I was able to check the hitherto semi-mythological Otto on Turkish Bayonets re: possible Turkish re-use of Mannlicher blades. He notes that the Turks re-used captured Mannlicher rifles and bayonets from various conflicts and some bayonets were kept as before but others modified for Turkish use e.g., his 49:10. BUT, note that - back to original post - Otto has no Gras bayonets listed for Turkish use. Thought I'd revive this one to go a little further with Greek WWI bayonets! 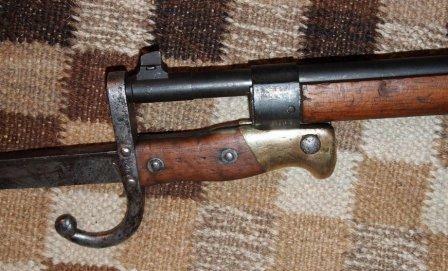 I have still not managed to find a single Steyr-made long Y(M) 1903 bayonet since the first one I saw on the market and stupidly did not buy, not knowing how uncommon they are. 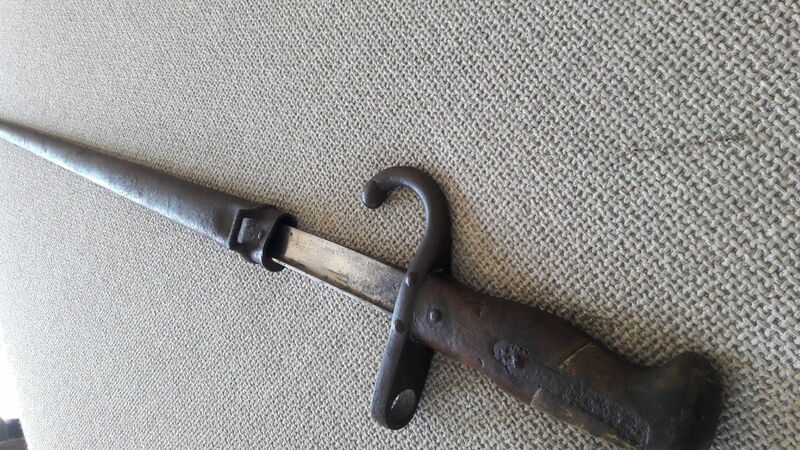 However, I have managed to get two more of the much rarer (uncoverted) Steyr-made Y(M) 1914 bayonets, so mustn't grumble really! 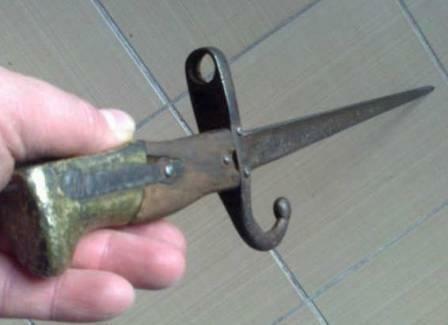 Be that as it may, they are rather odd bayonets, and I have not yet heard of any UK collector having one (Aleck? ), and so it might be useful to put them on wider record. 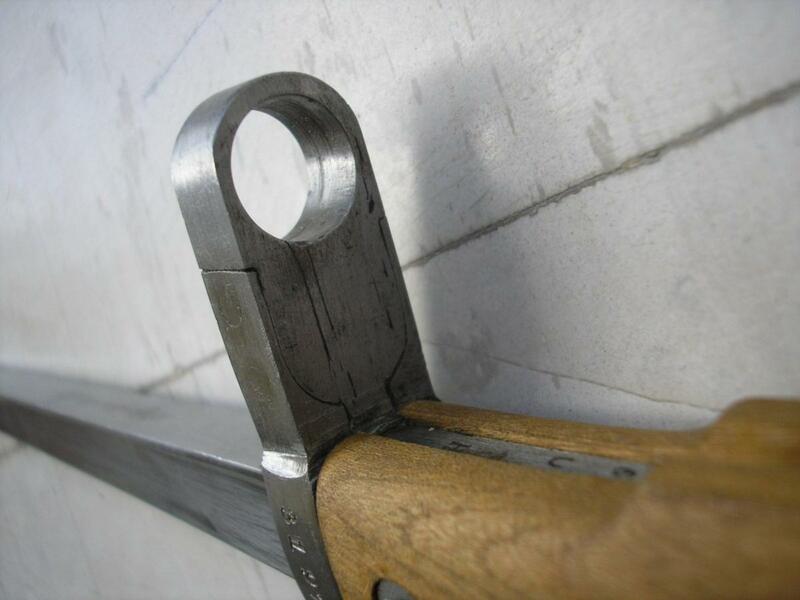 Briefly speaking, the Greek armourers did a great job in spreading and adapting the original Gras muzzle ring to fit in a lovely piece of very carefully machined metal to raise the muzzle ring to the required height with the appropriate diameter. 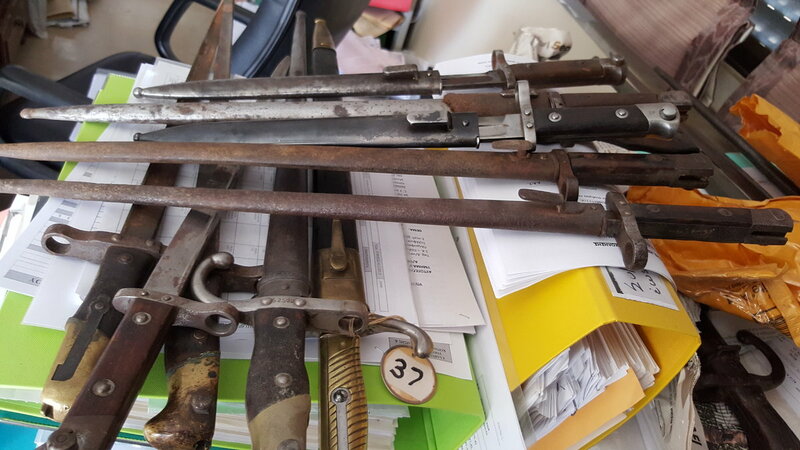 Attached are photographs showing the distinctive filled/raised muzzle ring of these '1874/1903' bayonets and also one (courtesy of a friend Rusnak, on another forum) showing how they fit the Mannlicher-Schoenauer rifle. 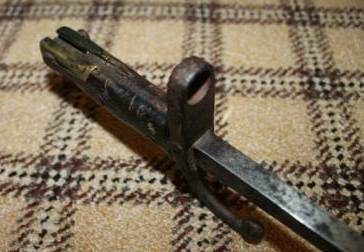 PS: should have added that the conversion did involve shaving a little of the hump-back on the Gras pommel - visible in the last photograph! Here's another photograph, posted by a friend Nick, on another forum, which shows much better the lovely job the armourers did in adapting that original Gras muzzle ring. PS: I am shocked Nobody has yet spotted and commented on the deliberate mistake in my previous post -set there to see how many of you knew your Greek WWI bayonets! 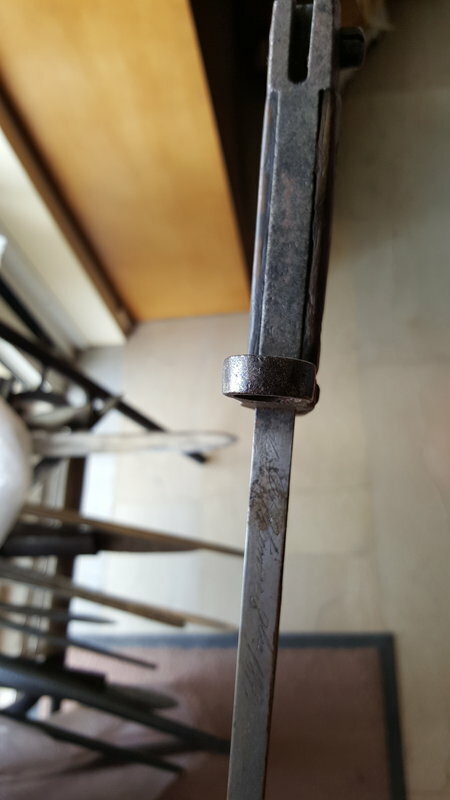 A test to see what GWF bayonet enthusiasts knew on the subject! Now pay attention out there! Don't be so occidentally oriented -if you see what I mean -as those of you who are collectors might miss bargains out there among the uninitiated! Here are some nicer photographs from my mate Giannis, of what he thinks is a production prototype for these modified Gras bayonets. But I am still wondering why nobody took up the challenge earlier? Am I the only GWF 'arms' member who looks beyond the Western front? 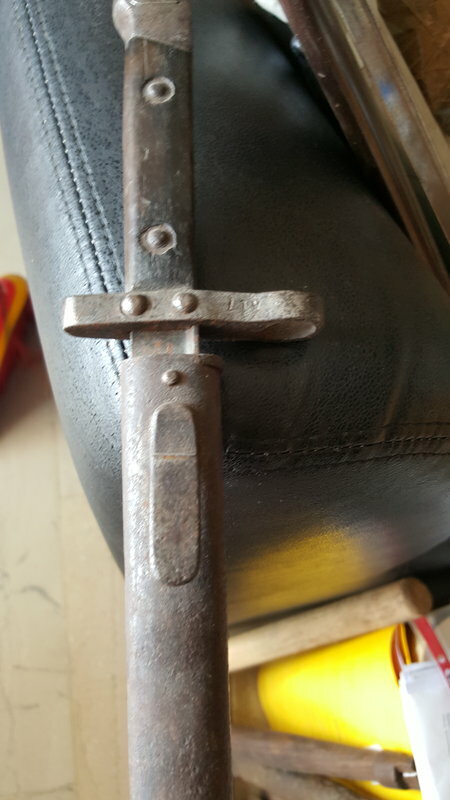 Nobody else have any Greek WWI bayonets? Time for a revival of this thread as this French Gras, looks to be 1871, but converted to fit the Greek MS 1903/1914 rifle, has appeared over here (would you believe with an asking price of TL 4,500 = USD 1,280!!!! ). PS: WOW, my first attempt at loading bayonet photographs since the size increase - and it seems to work! Stand-by, as I have quite a few more to post here! Although ignorance on my part precludes meaningful comment I agree with Mike - keep them coming. I'm struggling with the reference to 1871 in your last post? Thanks MikeyH and Michael! 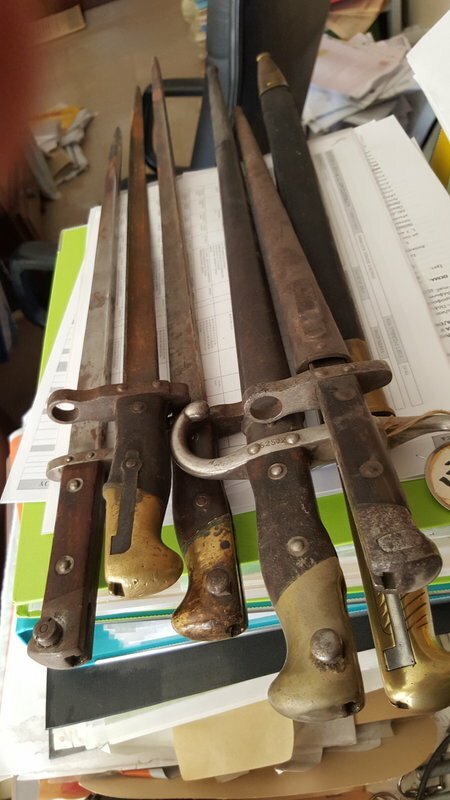 it has indeed been a while since I have had time to get things up re: bayonets in general and these "Greeked" 1874's in particular - and yes, Michael, it is indeed my mistake, an 1877 date on that one! As I noted above, I have never sought out any documentary or other evidence, but it does look at least likely that France directly or indirectly off-loaded spare Gras bayonets onto Greece after 1916 or so. This is a subject that would be well worth looking into further in the wider scope of understanding the ins-and-outs of how an 'agreement' came about in Greece, between the two opposing sides, as to declaring war on the Central Powers. As for other bayonets, well, my darling family goes off for a week in Istanbul soon, and while I will miss them, so with some spare time on my hands - who knows! here is my contribution about ww1 greek bayonets. 5 different types of bayonets, all used by Greek Army during ww1. some of them with St George killing the dragon [o n 3 of them]. Impressive set there, on the Greeks. Am confused,You have an S.71 mixed in there. Was the S.71 a fit or modify muzzle ring!? Las you have guessed. I do have a lot of "Other" but my core collecting has always been everything Gew.71, the rifles, carbines, Bayonets, cartridge boxes, muzzle covers ect. THE IS 71 WAS THERE BY MISTAKE. I have already post this to Julian's section for Turkish Ww1 bayonets but it has mainly a place in here. HERE﻿ IS AN EXTREMELY RARE CONVERTION. 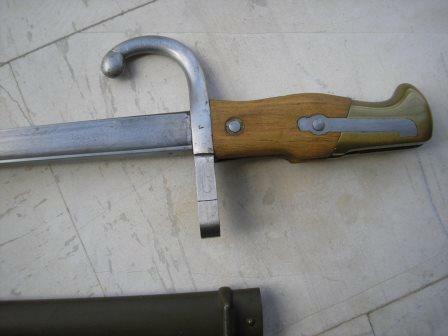 A TURKISH 1903 BAYONET, CONVERTED FOR GREEK MANLICHER ﻿1903 RIFLE FROM THE GREEK ARMY, DURING THE GREEK TURKISH WAR 1921-1922.